Want to go sailing, but don’t own a boat? No problem. Clubs where members share boats abound at yacht clubs, sailing schools, community sailing programs and fractional sailing businesses in greater New York and elsewhere. This is the story of one of them—the club-boat program at City Island Yacht Club (CIYC) on Eastchester Bay in the northeast Bronx. The yacht club, which celebrates its 109th birthday this year, started its club-boat program seven or so years ago when a member donated a 23-foot sailboat he could no longer use, and the club leadership decided to try an experiment—let members share the boat. That boat is long gone, but the club-boat program that it spawned is thriving. Three Catalina 25s and a J/24 make up the fleet, shared last year by 22 members. I was one of them, and there was never a day when there wasn’t a boat to sail. 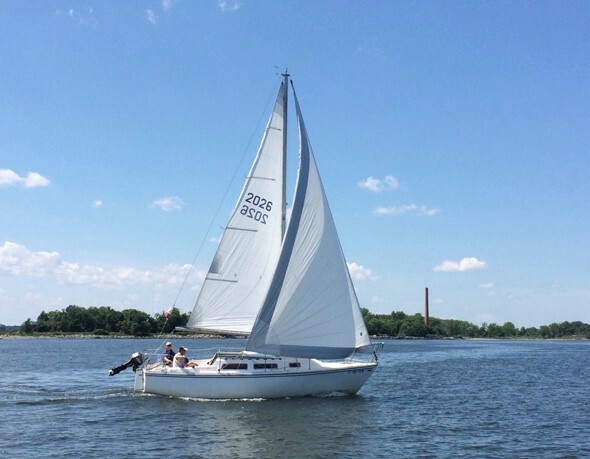 I sailed one club boat or another 18 times last summer, meaning I sailed more than the average boat owner, and many members sailed twice a week or more in Eastchester Bay and Western Long Island Sound during the 20-week sailing season. Although she was a seasoned crew, Branka had never skippered mid-size keelboats before, and she admits she had a lot to learn. “Skill acquisition is not easy as an adult,” she noted, “but everyone was supportive and available to help in any way. It took me a while to get into the groove.” She qualified as a club-boat skipper last year and is able to take the boats out on her own with friends or other club-boat members aboard. “I feel competent now, but this is just the beginning. I am always learning,” she said. Sailors should have some sailing experience before they join, with at least a basic keelboat class under their belts. They need to know basic maneuvers and sailing terms so they can work comfortably as crew with other sailors. To qualify to become a skipper—last year everyone qualified by the end of the season—they have to demonstrate that they know the rules of the road, points of sail and basic sail trim, and that they can handle the boat safely in up to 15 knots of wind. They must also show they can pick up a mooring under sail—a real test of sailing skill. While the boats all have outboard engines, CIYC wants to make sure members are fully capable of bringing the boat back safely under sail. Those who qualify first as crew but not as skippers, can learn from more experienced club members, take private lessons or go to a sailing school. One of the best things about the club-boat program, members say, is the camaraderie they share with other club-boat members and with active, boat-owner members of CIYC. Many members, myself included, race and cruise with people they meet on the yacht club porch or working in the boatyard. CIYC members are, for the most part, do-it-yourselfers who spend spring weekends prepping their boats for sailing season, helping one another and making friends while they do so. Club-boat members get to participate in the boatyard fun. While the boats are owned by the yacht club, members are responsible for doing the maintenance work, prepping bottoms, waxing hulls and keeping the boats clean and in good repair throughout the season. On Saturday, April 9, beginning at noon, City Island Yacht Club will host the annual Greater New York Sailing Group Meet and Greet beginning at noon. Last year 90 sailors attended this event, where several sailing groups, including the CIYC Club Boat Program, describe their programs, and boat owners and would-be crew get to know one another and make arrangements for racing and cruising. The club’s restaurant and bar will be open. For more information, visit the cityislandyc.org or meetup.com/greater-new-york-sailing-group. Betsy Frawley Haggerty, a freelance maritime journalist, is the former editor of Offshore Magazine, a member of City Island Yacht Club and a USCG-licensed captain and certified sailing instructor.